THANK YOU SPRING FOR FINALLY COMING! Now will you stay? 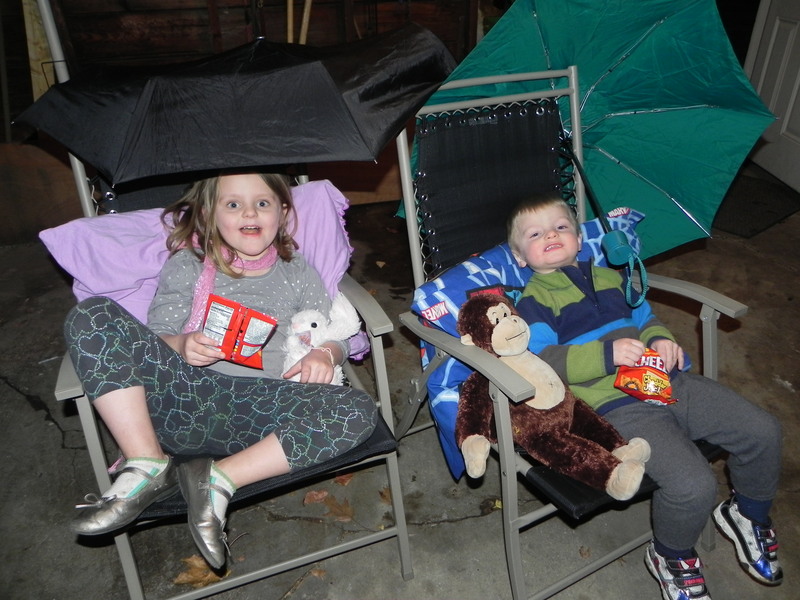 We were all going a little nutty the last month, especially Mom who wanted the kids outdoors but couldn’t throw them out in rainy 40 degree weather or snowstorms. But today, oh gorgeous sun and blue skies and mild weather. We couldn’t handle more than ten minutes indoors. 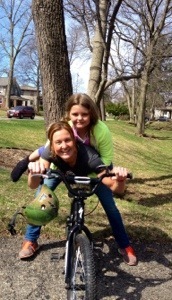 Bike rides, the woods, yard work, trampoline – anything to soak up the rays. Even Rocco seemed in a better mood. Yesterday ranks at the top of my list for awesome Winter days because it delivered hope that Spring will be coming shortly. We got up to 50 degrees! 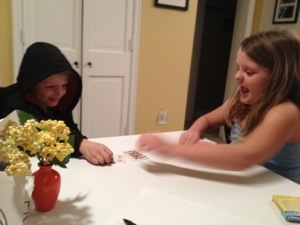 I got in a long run in the morning and then came home to the kids playing the card game, War. Mario had all the aces and was whooping on Ri. Thank god Ri is a good sport and can laugh it all off. Every time Mario won, she’d growl at him and he would laugh hysterically. 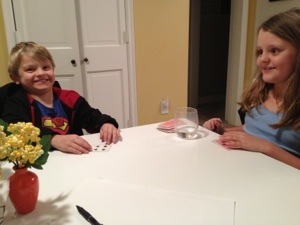 That was more fun than the actual card game. After War, they built a fort on our bed and played together while I cleaned up the downstairs. 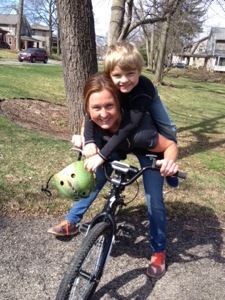 Then Mario rode bikes with Quinn while Ri and I took Rocco for a walk. 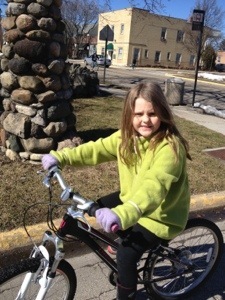 Ri broke out her bike for the walk, too. 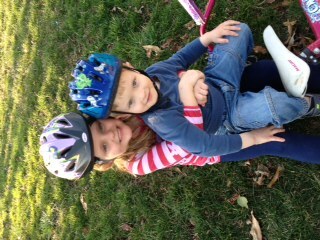 The first bike rides of the year! Whoo-hoo! Spring is coming. Rocco followed her like a bodyguard on the walk. 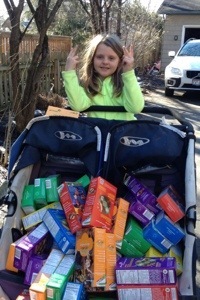 It was Girl Scout cookie pick-up day so we headed over to Kimberly’s to pick up Maria’s 207 cookies. she rocked it out this year! The entire car trunk was full of boxes of Samoas, Thin Mints, Do Si Dos, and Trefoils. If we got stranded, we’d be fine for 3 months. We came home and unloaded them in the garage and then started on our way. Mario decided he wanted to help us, too. 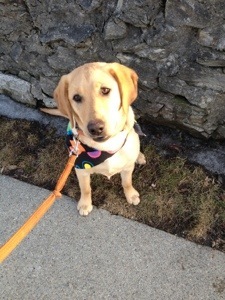 So there we were just like a couple of months ago when we went out to sell the cookies – all three of us and Rocco walking door to door and enjoying each other’s company. 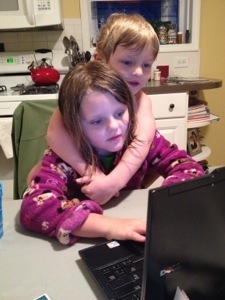 I just adore these kiddos. We passed out the initial round to six houses and then needed a pb&j break. After chowing on some lunch, we headed out again (sans Mario who decided he needed done dad time). This is how the stroller looked as we headed out on our next delivery. 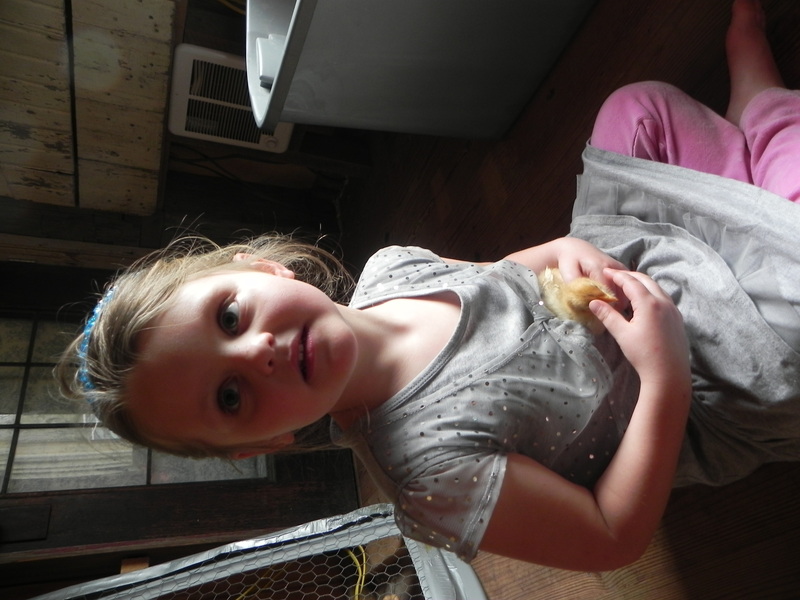 Ri was a trooper – she made it to every house. I was so proud of her! She would calculate how much people owed before she walked up to the door and always say “thank you.” What a good business woman. As a treat, I allowed her to take Rocco to the doggie wash. We’ve passed it a hundred times on our walk and wanted to take Rocco but never got around to it. Rocco, we found out, would have rather kept it that way. 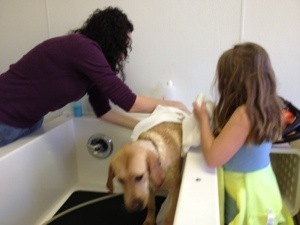 He was not fond of the water or the shampoo. I had to hold him tight the entire time. Ri wanted go help wash him but Mario declined because it would have meant he got a little wet (he can’t stand for his clothes to get wet). He had to spend 45 minutes under the dryer. We left so we didn’t have to see the torture. I am sure he was like “seriously, people? !” But look at how darling he looked afterwards! Love love love the day. 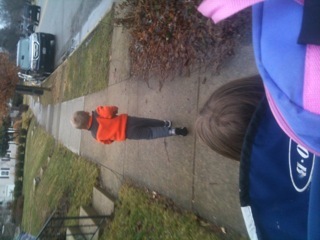 I am so grateful for sweet kids, a supportive hubby, a running partner pup, and an incredible family. And for Spring coming…. Let the bikes roll out. Let the shorts be worn. Let the convertibles lose their tops. It hit 70 degrees today, and life is good. I could not wait to get off of work and pick up the kids. I retrieved Mario first since he begged me to do so this morning and he is on the way to Maria’s school. He has been discussing Superheros all week, and when I picked him up he had a red cardboard cylinder around his bicep. I asked him what he was wearing. Awesome, dude. He says goodbye to his friends and we head to the car. On the way to Maria’s school, we talk about superheros. He loves to talk about Wonder Woman since I loved her so much as a kid. When we get to Maria’s school, he leads me to her classroom. The room is quiet with kids studying until Mario barges in and yells “Ria, mom picked me up first!” He always has to get one up on her and I am surprised she doesn’t just belt him some days. 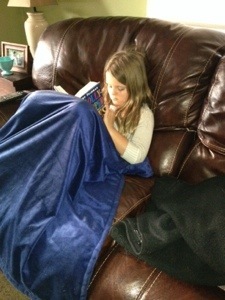 This morning she wanted me to take her to school so badly but Jon had to take her to get to work on time. She cried for me (she was having a “I need mommy” morning) as she walked downstairs. Mario stood at the top of the stairs and yelled to Maria “Mom is taking me to school – not you, Ria.” If she would have thrown her shoe at him, I could not have said much to her. He is a complete stinker. We left Maria’s school with Maria on my iPad and Mario on my iPhone. We got home and I let them sit on the front steps playing with the electronics while I put things away. It is so refreshing to open the windows and feel the breeze run through the rooms. Fresh air, finally! We got the bikes out to time Mario’s dash up the street and back and to try to help Maria learn how to mount her bike without falling. We cooked sausages. Jon came home and Mario darted down the sidewalk to greet him. We stood outside and watched the kids play. We admired our work from Sunday – the garden looks half way ready to go and the windows look good with their screens. Walking in the house and smelling the fresh outdoor air is a godsend. And hearing the kids playing outside on the back deck brings gratitude for the upcoming Spring. We woke up last Sunday morning and engaged in an old ritual – donuts from Tim Horton’s. The kids were able to wear only their nighties as we strolled down to the donut shop. They have not been able to do that for eight months. 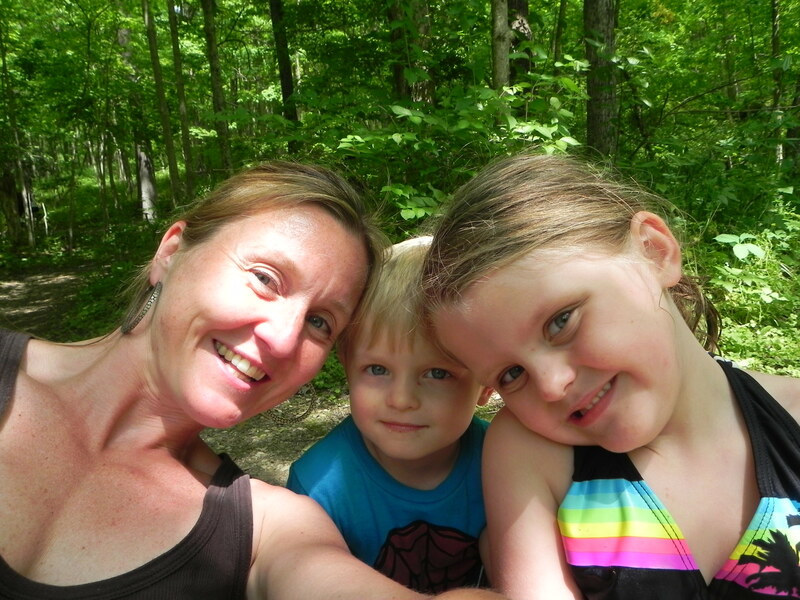 We decided as we chowed down on our timbits that we would head to Battelle Darby Creek in the afternoon. The kids went there with their Peepaw earlier in the week and loved it. As soon as we got home, Maria and I stuffed our backpacks full of random eats, water, and towels. 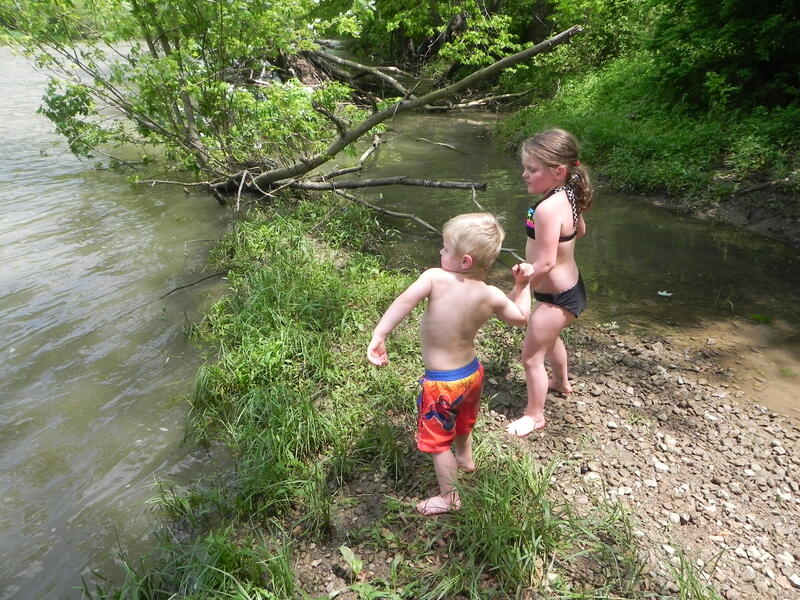 The kids wore their bathing suits under their clothes with the hopes we could get into the creek. With all of the rain, I was worried that it would be too swollen and rushing. With sunglasses and sunscreen on, we hopped in the car and headed west. The creek was only 20 minutes away and as we pulled up, Maria shouted “this is where we parked with Peepaw.” My dad knew she would remember everything when I asked him for directions, where to park, and where to enter. Throwing rocks and watching for water snakes! Maria braving the waters and Mario being way too daring! 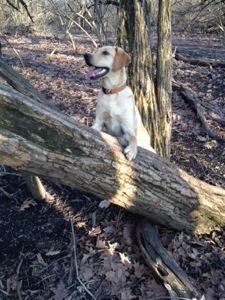 I started to fret at the thought of having her be too scared to ever want to go in the woods again. One of my favorite activities with the kids and that darn snake would ruin it. But, my girl came through after we left the pool of water. We went back to put on our shoes and clothes and keep down the trail. Maria complained of being hungry and not wanting to see a snake but then we found a small hill that led to a gentle opening to the creek. A family stood in the water. Mario threw off his shoes, and ran down the hill to the water. He picked up a stick and stood calf high in the creek. Maria hesitated, and I held my breath, but then she walked down the hill and stood in the water with Mario. 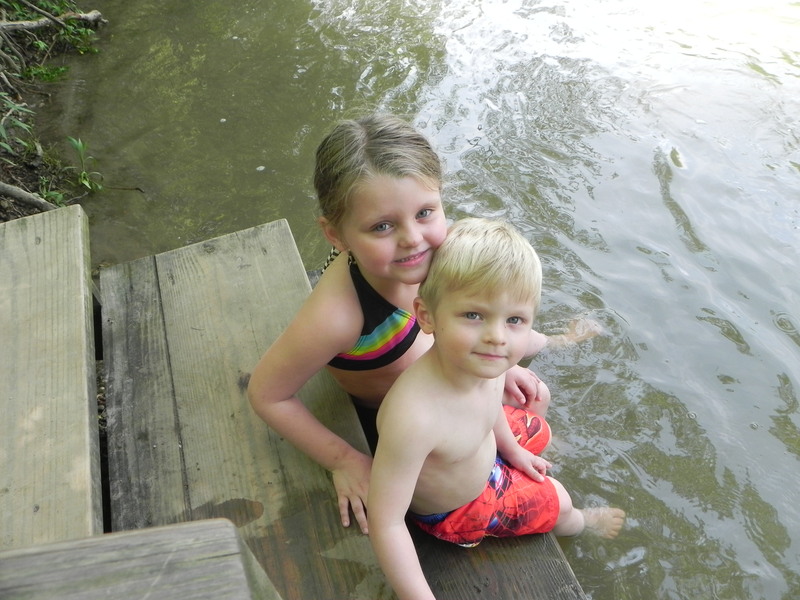 There were two girls and a boy in the water with their mom and dad and the two girls were sitting on rocks in the water and laying on their bellies letting the creek water push them around. That is all Maria needed. She moved closer to them and tried it out, too. Before I knew it, I was warning her to not go too deep. She was cured of her water snake fear. Mario spent the entire time using his stick as a sword and a water splashing tool. Happily, he did not use it to hit anyone in the family next to us. After 30 minutes in the creek, we stepped out to eat lunch on the hillside. 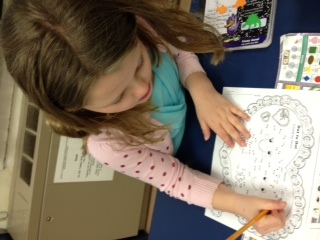 If I was a poet, I would have had everything I needed to write a famous poem while sitting at lunch with the kids. As we ate our pretzels and cereal bars and cheese and crackers, a Mexican mother and four young kids arrived and jumped into the creek. They exhibited pure, unadulterated joy as they splashed around in the water and the mom laughed while taking pictures and talking in Spanish to them. Joy is universal. 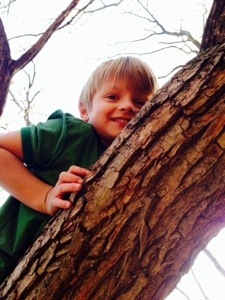 A centipede moseyed up the tree in front of us – Maria, of course, pointed him out to us. “Really?” I thought as I laughed about how perfect the day was turning out to be. We were pretty exhausted when we walked out to the car (after a jaunt on the playground that has a small climbing wall – both kids scaled it like pros). Mario wanted a movie but the movie he had chosen for the ride out to the creek was horrid – massive killing and blood. I guess we didn’t read the rating on the movie box even though it was a PG movie and still contained all of that nastiness. Mario was livid when I took it out on the ride over; Maria felt so bad she told me she would close her eyes and sing so that Mario could watch it. Instead, she got to hear Mario cry and scream for 10 minutes until I said “Look at the cows out the window” and that little mind went from pissed off to amazed at the sight of bovine grazing in the field. I really wanted a McDonald’s diet cooke and small fries and quiet for a half hour so I went all out and stopped at Giant Eagle to see if they had a movie to buy (yes, desperation!). Besides, we needed a new movie to add to our repertoire. Of course, they had nothing less than $24,99 and as much as I was tempted to go for it, my practical, money-conscious self could not do it. On the way out, we saw a Red Box Video. We see people at those boxes in Grandview all the time but we had never made the dive to do it ourselves. We went for it and rented Toy Story 3 for $1.00. By the time we got in the car, buckled up, and turned it on, Mario was passed out. Maria hung in there with me but sat quietly watching the movie while I enjoyed the quiet ride home with my salty french fries. What a marvelous, awesome afternoon. I have thought about that afternoon almost every day this week, especially when I started to get irritated with a colleague or a work situation. I remember Maria lying on her belly in the water or Mario trying to skip a rock and they at the least made me smile and at times, even helped produce a significant attitude adjustment on my part. Nourishing moments for the soul. M & M getting ready for the hunt! I love Easter. It is my favorite holiday for two reasons: (1) I adore chocolate and there is a ton of it between the easter egg hunts, the grandparents, and me splurging on it “for the kids’ baskets;” and (2) people seem to be more relaxed on Easter – less frantic about presents, meals, attire. Easter comes right at the time of a new season – winter cold is gone and grass is turning green. People are excited about being outside again. We celebrated Easter today out at the farm. The forecast called for rain all weekend with strong thunderstorms at times. When we woke up this morning, the sky was grey and dreary but had promise to it. Patches of yellow and blue broke through in the sky, and I had a feeling during my morning run that we would be spared. I was right. 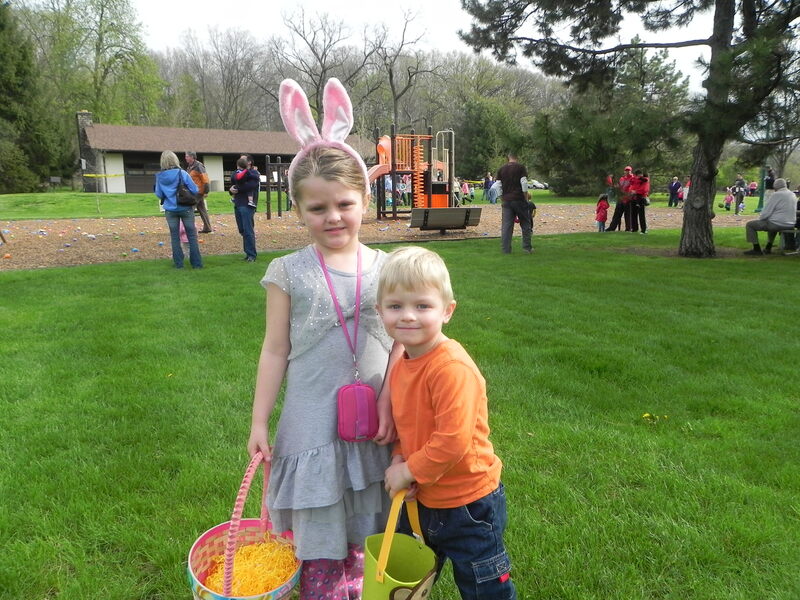 The Grandview Easter Egg Hunt began at 10 am with soggy grass underfoot but no rain showers. Maria’s nightmare came true when she heard that 5-7 year olds were grouped together (“I will never get as many eggs as 7 years olds). 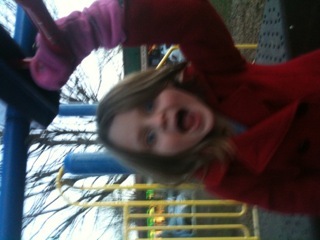 However, she perked back up when she met up with her friend Anna and her grandma. I stood with Mario in the 2-4 year old group coaching him about how to engage in the hunt (“pick up the eggs first – not the bags of oreos and cookies”). 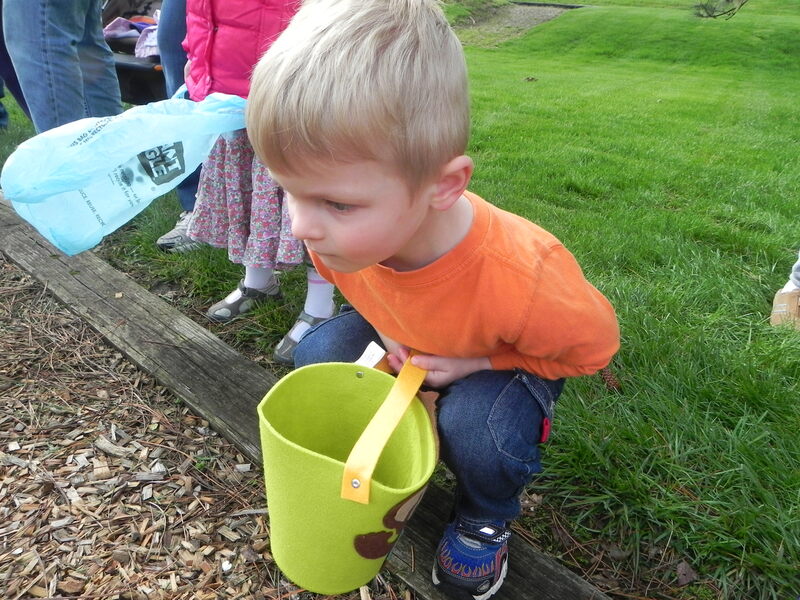 He put his game face on after my speech, and anxiously awaited for the announcer to yell “GO!” What comes over me and other parents at these easter egg hunts? We are so competitive following our kids around the area pointing frantically at eggs that we see. When the kid is looking in the opposite direction, we yell “Mario, look! Mario! Mario, over here! Mario!! !” Mario ended up with more eggs than Maria, which led to Maria frowning and complaining that she did not get “any” eggs even though she had three in her basket. Her friend gave her two of her eggs, which led to 180 degree change in Maria who smiled from ear to ear. the kids sat down to open their eggs, and Mario promptly gave me the first chocolate candy piece he opened. What a doll. I had told him how much I loved easter chocolate and he had told me that he would share his with me. However, I was not going to believe it until I saw it. And there it was. He does love his mama! Maria, on the other hand, gave me a stern look when I grabbed a chocolate chip cookie from her basket. “Mom, this is my food.” She is so generous when it comes to other things but not her food! We rushed home after the hunt and hopped in the car to the farm. 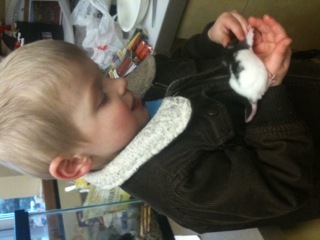 Within five minutes of walking in the door, Maria and Mario and their cousins found the baby chicks. Tiny and precious and so delicate. Just what three and five-year olds need to handle. But Grandma Meg managed to let all of the kids hold them without incident. Mario chanted “Calm, calm” to the chick while he held it. Maria acted like she was a vet while she held one asking me what was wrong with my baby chick. They were infatuated at first sight. Maria and Anneliese, her 8 year old cousin, played beautifully together. Surprisingly, Mario and his three-year old cousin, Ben, also played together for the first time ever. In the past, they were into their own things (and still at that young age where you don’t play much with other kids) but this time they were by each others’ sides for most of the day. Ben would yell for Mario and Mario would run to him. Mario would ask Ben to get something for him and Ben would get it. They threw stones in the stream for 30 minutes and talked about being in the army while they rode the rocking horses. They used croquet clubs as hammers and swords. Boys. Maria and Anneliese held the chicks a lot and walked Rosie and played in the stream. Tomgirls – yeah! We ate yummy ham and potato salad and deviled eggs and corn casserole and butter rolls. Patty’s potato salad won everyone over with people going up for thirds! I swear I am going to enter her p. salad into a contest – it will undoubtedly take first place. Desserts made my stomach larger just looking at them – brownies, cookies, shortcake, chocolate cake, lemon bars in addition to all of the Easter candy! Oh, how I love this holiday! But, oh, how I wish I had some sort of will power. I get on Maria about eating too much but then I stand around the table eating 3 brownies, cake, candy and cookies. I blame those Menkedick genes that cannot resist chocolate (unless you are supernatural like my father). My 91 year-old grandmother devoured the desserts just like me so I think I am doomed. 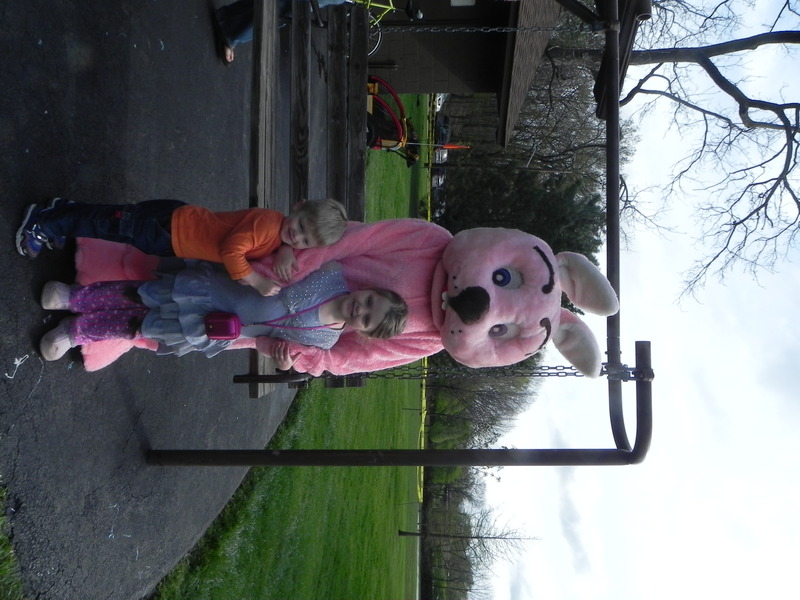 The kids got to ride the horses towards the end of the day and then got treated to a stellar easter egg hunt. There is part of me that still wants to participate in those hunts – I see an egg hiding in the fence post and I get so excited. I was a damn good egg finder back in my day…. We finished up the afternoon holding the chicks some more and chatting with family that we don’t see as often as we would like. Maria would love to have Anneliese closer and Mario and Ben would have a blast together now that they are the ripe old age of three. Grandma M. is strong as ever, carrying on conversation and watching the kids play. I wish I lived closer to her so we could see her more often even though she even states that having M&M over any more often would seriously wear her out. 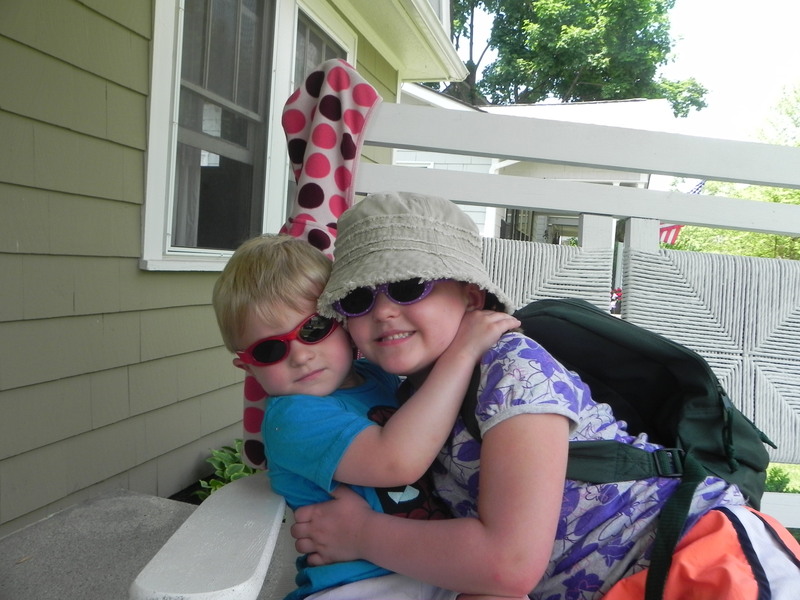 She has got to be kidding – my kids are little angels…! In sum, a great start to a holiday weekend. The farm is a gem, and Meg did an awesome job hosting us all. Dad did an awesome job entertaining the kids (even though he allowed Mario to fall in the stream!). And the rest of us just soaked in the beauty of a wet Spring day. Mario running with Maria in the stroller shouting commands! Maria and Mario agreed to a walk two evenings ago but we got in the stroller and remembered that the front tire burst during our library trip last Sunday when we put Maria on the foot rest of the stroller to make room for her friend and Mario to sit in the stroller seats. The stroller tire lasted almost a half of a mile before it succumbed to the pressure from above. 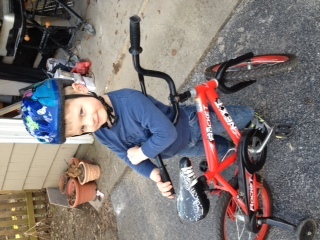 When I told the kids the stroller was out of commission, Mario went straight for his bike. Maria went straight to my arms. When that idea was shot down, she begged for the one-person stroller. Mario riskin' it by petting a rat. When we looked up, Mario was almost to the end of our block. He has not yet learned to make complete stops at intersections so I yelled for him to stop. He didn’t. That is when Maria Grace took charge. She jumped out of the stroller and darted towards the intersection yelling “Mario Joseph, stop!” When she caught up with him (after the intersection where he did glance back and forth for a millisecond), she ripped him up. And there you have it. My girl taking charge. The scary thing is that she sounded just like me. She has listened to me too well. Mario listened to her entire speech and followed it up with a sticking out of his tongue and a taunt (similar to what he does to his mama). Maria galres at him and scolds “that is inappropriate behavior, Mario.” Words right from her mama’s mouth. I intercede between the two but basically reiterate everything mini-me has said to him. After retrieving water and saying hi to a few older guests (Maria asks if I am proud of her for saying hi to them since I tell her how good it makes people feel to see a little girl smile at them and say hi), we head back out for the ride home. There are two girls sitting outside, and Mario walks by, looks at me, and whispers “Look at those hot girls.” Heaven help me. Who teaches him these things? Maria rolls her eyes at me but then eggs Mario on by whispering “say hi to them, Mario” Yeah, I think I have a clue on who is his teacher…. Mario mounts his bike and takes off past Jeni’s and Stauf’s reciting “I am cool” the entire way. Maria follows him closely making sure that he is not getting too far from us. He stops at the light and both of them look down to see a tiny purple flower blossoming from the crack of the sidewalk. “Look at the beautiful flower. That is a sign of Spring.” Maria states.